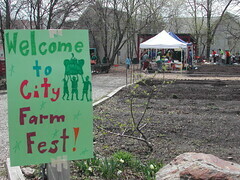 compost distributionJoin us on our West Cottage farm to kick off spring! Bring along family, friends, neighbors. Enjoy great food and live music. 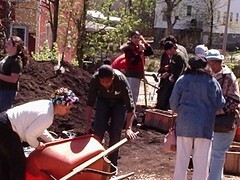 Take advantage of our compost giveaway ($1/bag, free when you bring your own durable bags or containers, 5 bag limit). Buy transplants ($3/six-pack) and seeds for your garden--most varieties selected for high yield/ease of growing. Come early for best selection. Meet other participants and learn more about planting your raised bed by attending the workshop, offered twice (11:30am & 1:00pm). Note: If your raised bed was installed in summer or fall 2009, or you are getting one this spring, you can pick out 6 seedlings for free at this event.